The fact that it had disappeared and then disregarded—so much so that newer naturalists were not even told about it—was curious. How could a species disappear from an entire region and then be effectively forgotten? As an endangered species biologist I felt compelled to resurrect this frog’s story in an attempt to find out more about why it disappeared. This information could give agencies considering listing the species under the federal or state Endangered Species Acts or reintroducing it to places where it has gone extinct better information on which to base their decisions. The foothill yellow-legged frog (Rana boylii) once ranged from Oregon to Baja California, from mid-elevation sites to the coast. Like many California frogs, at one time they were so abundant that it was difficult to avoid stepping on them when walking along streams. Less than a decade after these observations, no one could find a foothill yellow-legged frog anywhere in southern California. As species disappearances from unknown causes go, this is breakneck speed. The global trend of amphibian declines has pointed to habitat loss, UV radiation, and pesticides as potential culprits, yet most of these act gradually, slowly chipping away at populations over time. One of the only threats that can cause rapid extirpation—like that of the foothill yellow-legged frog in southern California—is disease. A mountain yellow-legged frog (Rana muscosa) that has succumbed to chytridiomycosis in the Sierra Nevada of California. Chytridiomycosis—caused by the fungal pathogen Batrachochytrium dendrobatidis (Bd)—has devastated frog populations all over the world. Could it have done the same to the foothill yellow-legged frog in southern California? To take a closer look at this, I needed to get more information about when exactly it disappeared, how abundant it was before it disappeared, and—most importantly—when Bd arrived in the region. If Bd arrived immediately prior to the frog’s disappearance, then that would support my hypothesis that they were afflicted by chytridiomycosis and their populations were subsequently affected. It’s important to note that this would not prove my hypothesis, which is about something that happened in the past, and the past cannot be re-created in order for us to make objective observations. All we can do is make our best use of proxies of the past—windows that give us a glimpse of what things were like back then. It is important to acknowledge that windows only provide a partial view of the universe, and do not reveal the whole story. The first proxy I used was historical, archived amphibian specimens—available in natural history museums. In an earlier chapter of my dissertation I tested an improved protocol to better detect Bd DNA from museum specimens (hint: it’s pretty tricky because the formalin used to fix the tissue damages DNA) and used that protocol to look for Bd DNA in all amphibian species that occurred in the same places as foothill yellow-legged frogs before, during, and after their decline. As a second proxy, I interviewed people who were visiting southern California streams before the foothill yellow-legged frog disappeared. At first, this idea was a tougher sell to my dissertation committee, because it’s not a method that ecologists—or any natural scientists for that matter—typically use. Part of the reason for that is it can be messy—people’s memories are colored by their experiences, and by other people— and can hardly represent objective observations. But I had to try it because the information that I sought didn’t exist anywhere but in people’s memories, and—sometimes—the field notes stashed away in their garages. I also used archived field notes to find out more about when foothill yellow-legged frogs were observed, and how many of them there were at different times. I learned to conduct informational interviews by attending the UC Berkeley Oral History Institute one summer, and received a lot of helpful advice about historical methods from the environmental historians at UC Santa Barbara. With the help of some stalwart undergraduate assistants, I sampled over 1300 museum specimens and ran three separate qPCR tests on each one of those samples. From the interviewees and the field notes they shared, I was also able to identify more records and abundance estimates of the frogs. I found that although Bd arrived in the region long before the foothill yellow-legged frog began to decline, it spread widely immediately before the frogs disappeared. Results of museum specimen sampling through time. Red dots indicate where Bd was found in a museum specimen for the time period indicated at the top of each map. There was a lot going on in southern California in the mid-1960s: it was starting to feel the pressure of a rapidly expanding Los Angeles metropolitan region, and this was accompanied by increased recreational use of streams that were once rarely visited by people, except for the occasional herpetology class or naturalist. Roads extended deeper into natural areas, making it easier for people to access them. Exotic species began to appear—either intentionally stocked or as abandoned pets. If Bd was present in the region before this, all of these factors could have assisted in its spread in the 1960s. How did Bd get to southern California in the first place? In the early 1900s bullfrog farms were gaining in popularity, and a small population of bullfrogs was brought to Topanga Canyon (Los Angeles County) in 1912. Bullfrogs are known to harbor Bd and spread it between continents via the large international trade of amphibians. 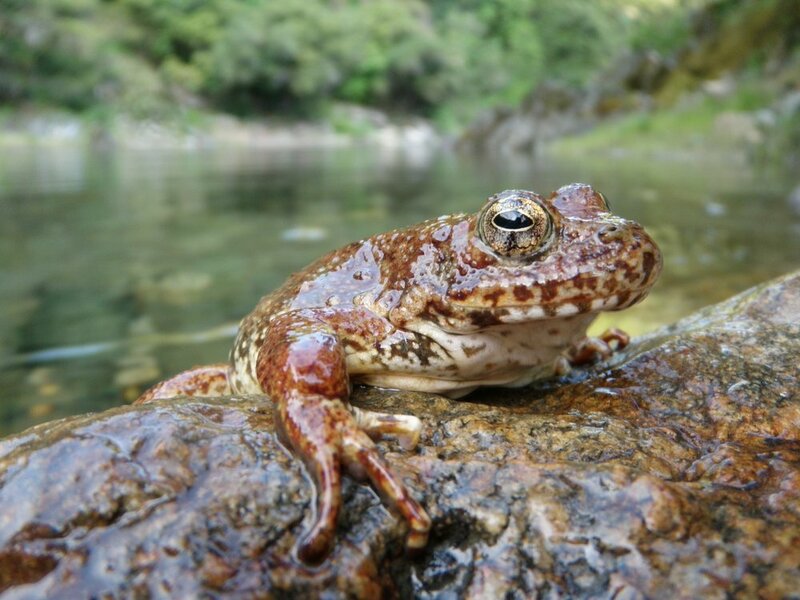 There is much more to the story, including whether the foothill yellow legged frog is susceptible to chytridiomycosis (spoiler alert: yes but not always) and why it isn’t extinct elsewhere in California. These questions and more are discussed in the full article.